On January 19, I received an exciting e-mail from Dr. Angelee Deodhar, a haiku friend of mine in India. The site says as follows. His entry to the contest was done in the form of the excellent publication of “Canada Project: Collected Essays & Poems, 2013 Volume 8”. The Award marks a celebration of the praise-worthy achievements made by a non-Japanese native who has chosen to live in Japan and with rare passion and dedication devoted himself to education through haiku and related subject matter. His direct commitment is of course to the interests of education, Japan, Canada and his own occupation. However, his case also has shown that such specific purposes can serve, even indirectly, the purposes of the whole (in our case the haiku world) if they are exercised properly, professionally and selflessly. David receives the Award of 500 GBP (British pounds) minus money transfer fees. David, O-medeto-gozaimasu!, Many Congratulations! There were so many entries to The R. H. Blyth Award 2013, among which those of freshness and high quality were abundant. This proves to be especially rewarding when one considers the extremely wide variety of genres entered, from haiku anthologies to academic papers. On January 20, I received an e-mail from Professor David McMurray as follows. Thank you for your kindness. 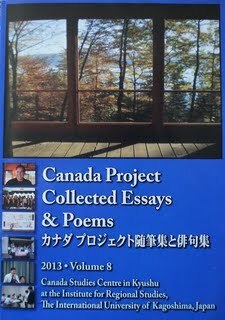 I am humbled by your praise for my Canada Project Collected Essays & Poems Vol. 8. 『カナダプロジェクト随筆集と俳句集』七転び八起き When life knocks you down 7 times, stand back up, and keep trying the 8th time. Perhaps I can read a chapter from the book for you when I go to Akita to meet your members this autumn? Professor McMurray is invited to Akita as one of the panelists of International Haiku Symposium, whose theme is “International Haiku Today”, held at Akita International University（国際教養大学）on October 25 (Saturday) this autumn. abstract: The editor of the Asahi Haikuist Network will share the latest developments in the history of world haiku. Noting that it seems like a decade has passed since his weekly newspaper column began, but actually it has been two, he will explain how he began collecting haiku via email and the Internet when he was member of the Shiki Project at Matsuyama University in 1994. He will also commemorate the 50th anniversary of the death of R.H.Blyth (28 Oct, 1964) who wrote “the day is coming when haiku will be written in Russia, in the Celebes, in Sardinia.” Reading excerpts from his book which won the R.H.Blyth award, the presenter will explain that in 2014, there is a vibrant community of haikuists worldwide, composing and sharing haiku in 56 languages. Here are three e-mails of congratulations on Professor David McMurray having won the R.H. Blyth Award 2013, which were sent to me by a few students at the International University of Kagoshima (鹿児島国際大学). The first e-mail says as follows. マクマレイ先生が2013年度のR・H・ブライス賞を受賞しました。 R.H. Blyth Award 2013 はすごいです! 新納仙一 says in his e-mail as follows. Ms Kuga went to Canada to study English for 6 month. The last e-mail says as follows. 1st year student of International culture Doctor course.